Wall Mounted Bat Display Case | Perfect Cases, Inc. 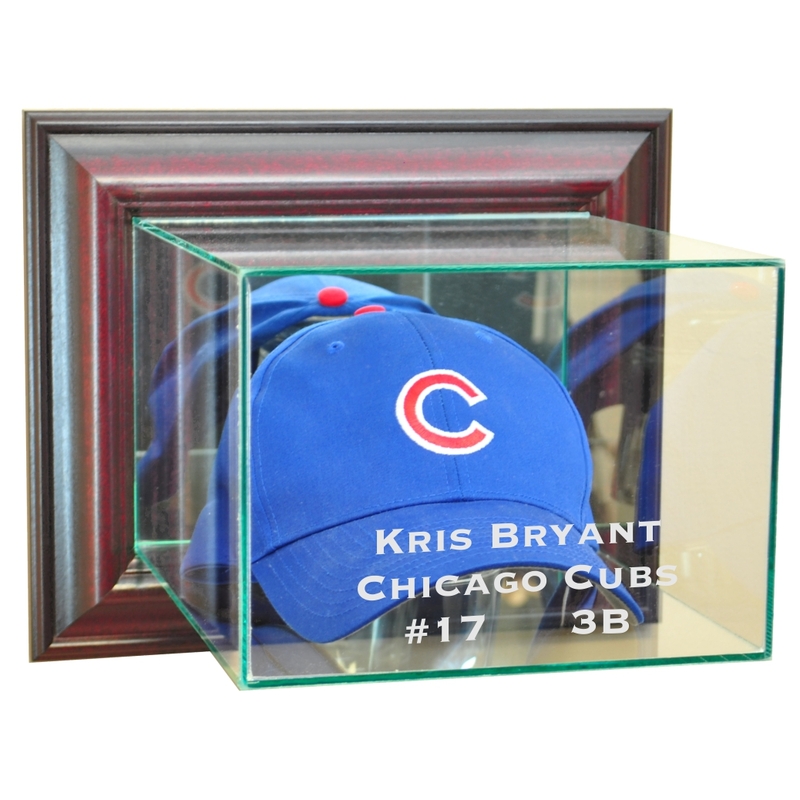 This uniquley designed wall mounted display case is the perfect way to protect and display your autographed baseball bat. This case is made so that the top hinges open for easy access inside. This display case is made with UV Protected, double strength glass and mirror and accented with real wood moulding. This display case is made with mirror on the back to enhance the look of what you want displayed. We also use no acids in our display cases to prevent signature fading. This case also includes clear acrylic bat holders. This bat display exceeds my expectations and is awesome! Total attention to detail and I highly also recommend the glass engraving. When it arrived it was also in the best packaging I have ever seen and was professionally done. Perfect Cases and Frames are the best period ! Our case arrived, well packaged, but unfortunately there was a crack in the glass. Perfect Cases replaced the case almost immediately. Your customer service is fantastic and the quality of your products is excellent! I had purchased a bat case and upon delivery noticed there was a small chip on one of the corners. I took lots of pictures and called the next day about what I should do. The gentleman quickly and simply solved my problem by shipping a replacement out right away and included a return slip for the original. As a gift, I needed this before the holidays and even with the initial problem, I still received my case in plenty of time!! Ordered a wall mounted bat case and when I received the case the glass was cracked. I'm sure this happened in shipping and was no fault of Perfect Case but man was I majorly bummed when I opened the box to see that nasty crack. I called and explained the situation and with zero questions other than to confirm my order I was told I would receive another case....and BOOM! Case arrived yesterday, perfect and ready to be mounted. I will use Perfect Cases for ALL of my future needs! I had an absolutely flawless ordering and delivery experience with Perfect Cases. I ordered the product late and needed to have it delivered before Christmas. Santa Claus delivered! I was very pleased with the way my order was handled from time it was placed thru delivery to my house. The quality of the display along with the wording identification was excellent. Finally, making sure my order was received before Christmas was greatly appreciative. Absolutely priceless , Excellent quality. I would recommend your company to anyone who wants a top quality products at a great price. The engraving on my case WAS excellent I have to say that every single person who has seen it was in awe. However the bat supports came ALL busted up. However I called Steve @ perfect cases and he assured me that he would send me replacement parts asap. Came packed nicely, nothing was missing or broken. Woud recommend to anyone looking to display sports memorabelia. The case looks amazing the engraving came out beautiful couldn't be happier thanks so much ! It was just what I wanted. You can tell by the quality of the material that was used it would be a good addition to my collection for years year's to come. Thank you.